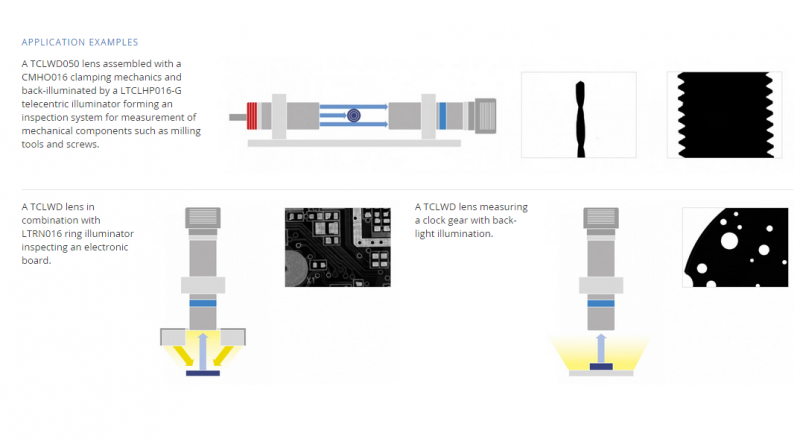 TCLWD is a range of telecentric lenses specifically designed for electronic and semiconductor Automated Optical Inspection (AOI) and tool pre-setting machines. All these lenses feature a working distance of 135 mm while ensuring excellent optical resolution, high telecentricity and low distortion, thus matching and even exceeding the industrial requirements for the target applications. The long working distance allows for extra space, which is essential if you need to install illumination, pick-up tools or provide the necessary separation from hazardous production processes. In addition to the long working distance, TCLWD optics deliver a numerical aperture large enough to take advantage of high resolution / small pixel size cameras, making these lenses a perfect match for general-purpose 2D measurement systems. Long working distance Perfect for electronic components inspection and tool pre-setting machines. 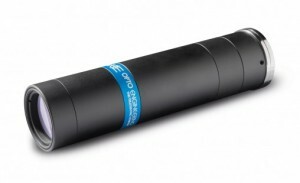 High numerical aperture For small pixel size / high resolution detectors. Easy rotational phase adjustment Robust and precise tuning of the lens-camera phase. Full range of compatible products Fits LTCLHP telecentric illuminators, CMHO clamping supports and LTRN ring illuminators.